You are here: Home / Mind Power and Weight Loss / What Triggers You to Eat? Thoughts: It always begins in your thoughts. Your whole world is created in your thoughts. If you’re self-image has been damaged, your low negative image can trigger emotional eating. Physiological: Often times we eat in response to physical cues like headaches (sometimes a headache is in fact telling us we’re in need of energy…that our bodies are indeed hungry…but not all the time, so be aware of when this headache strikes). Situational: Certain activities like going to the movies or sitting at home watching TV may trigger emotional eating. Passing by certain stores that advertise our favorite foods may trigger an eating response. Emotional: Eating fills a void for so many lonely people and is an emotional response to uncomfortable feelings, fatigue, stress and anxiety. The best way to discover what your personal food triggers are is to keep a detailed food diary. Keep track and write down what you’ve eaten and what kind of thoughts or emotions you were entertaining at the same time you ate it. Identify them, record them and eventually you’ll see a pattern emerging. When you are stressed and anxious pay attention to what you’re reaching for. Is it food? Identifying these triggers is only the first step. Now you know what makes you eat…however, this has not solved the problem because most likely by the time you’ve figured out what it is that triggers you to eat…from emotions to conditions, this trigger has become habit…one that you will need to break. Habits can be broken…it just takes your attention in the moment. You need to be replacing your eating triggers with other activities…you need to get your mind focused elsewhere. For example all these are good substitutes for emotional eating…but everyone is different so tap into your own lifestyle and pull out what it is that makes you happy and substitute that activity for eating when you feel the impulse. Go for a walk (or run if that’s your thing)…exercise of any kind will work. It makes you feel better about yourself too so you can lift your spirit while avoiding your triggers. Take a hot bath…might not work for some but others love a nice hot bath to soak in…bring a good book with you and treat yourself to some welcome silence. Perform yard work: I prefer yard work as it gets you outside in the fresh air…but sometimes being outside isn’t always plausible. In those cases, find a closet that needs cleaning, organize your photos or any other pleasurable activity. Talk to a friend and confident: look to your friends and relatives for support. Call and strike up an interesting conversation that takes your mind off of eating. There are distinct differences between emotional eating and physical hunger. 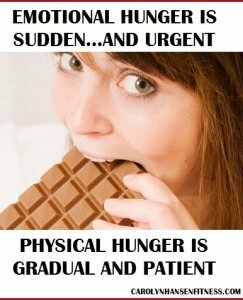 Cravings: If you are craving a certain foods like pizza or ice cream (and, nothing else will do) it most likely has nothing to do with real hunger but a need to fill a void. Emotional hunger comes on suddenly while physical hunger is more gradual…increasing over time. Emotional eating also causes you to keep eating when you are full while real physical hunger does not. If you are dieting, working-out and doing everything you can think of to lose those extra pounds but they refuse to budge…I can help. “Stop Weight Loss Resistance” was created for people just like you. You can take off that stubborn weight you just need the right information.